This is one of those moments that make you want to ask someone to “pinch you”. And not just because I am center stage at NJPAC (New Jersey Performing Arts Center) holding Trigger, one of the most famous guitars in Country Music (I am a huge Willie Nelson fan!) But because we did it to honor our dear friend Brenda Price who is battling ovarian cancer. Our very good friend Mickey, who works for Willie Nelson, has invited us to countless concerts. When he called about the New Jersey show, he asked if I would be willing to do him a favor. He wanted to dedicate one of my images to his partner. 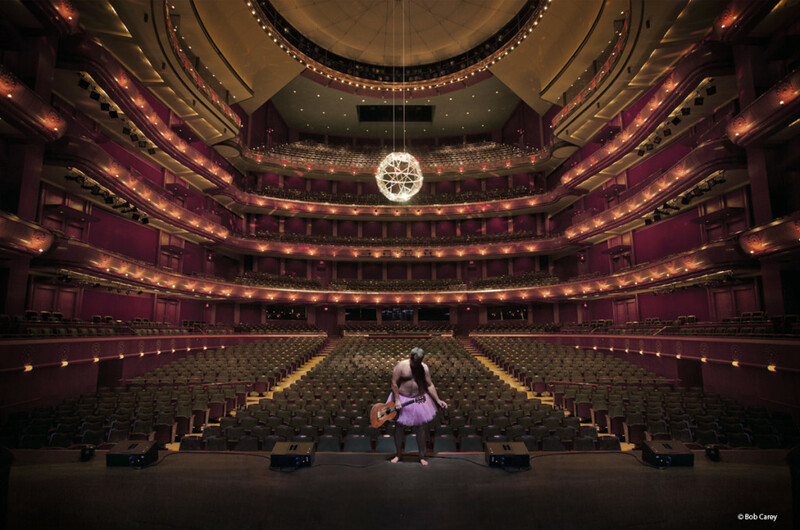 How it all came together is almost a blur because within 48 hours, I was lighting one of the most beautiful concert halls in America – NJPAC in Newark, NJ. The shot came together perfectly, and is honestly one of my favorites. To all the country music fans battling cancer, especially Brenda – this one’s for you! And a very special thank you to everyone at NJPAC for making this such a special moment for all of us. Because this is a Special Engagement Print, the following editions are now available for sale. We will honor Brenda Price’s battle by donating* a portion of net proceeds from the sale of these prints and postcards to the Hera Foundation for women with ovarian cancer. HERA’s Mission The mission of the HERA Women’s Cancer Foundation is to stop the loss of women from ovarian cancer by promoting Health, Empowerment, Research, and Awareness. *RC Photography (owners of The Tutu Project) is a for-profit company. We have dedicated The Tutu Project photographs to help fundraise for the Carey Foundation for women with breast cancer. “Trigger” product sales will donate 50% of the net proceeds to the Carey Foundation and 50% will be donated to the Hera Foundation. Postcard sales will donate 50% of the net proceeds to the Carey Foundation and 50% of the net proceeds to the Hera Foundation for women with ovarian cancer. you are awesome like that! I love this photo!Simply beautiful! this one is one of my favorites! I love it! Thank you for sharing and for what you do. Just when I think I’ve seen my favorite pic, you post another. Bravo! This is such an amazing image on so many levels! That guitar is a piece of music history! That is beautiful, Bob! Thank-you for sharing it with us. Thank You For All You Do For Breast Cancer YOU are terrific. Yep! That’s the right word! Had it at the tip of my tongue! Speechless. I love this one! A new favorite of mine !!!! Thank you for all you do !! How COOL IS THAT!!!! Willie, Trigger AND The TUTU!!! so far, Swan Lake is my favorite! You will rock the world! How awesome is this? You are doing some amazing things! Love it!